IDF 2012 Intel wants to dominate the networking and storage arenas, each worth about $25bn a year in sales, just as much as it ever wanted to dominate the server racket, which accounts for around $50bn a year in sales. And if its goal is to double the revenues of its Data Center and Connected Systems group to $20bn by 2016 – as general manager Diane Bryant reiterated in her presentation at Intel Developer Forum yesterday then it is going to have to get a much bigger piece of the merchant silicon and software racket relating to switches. 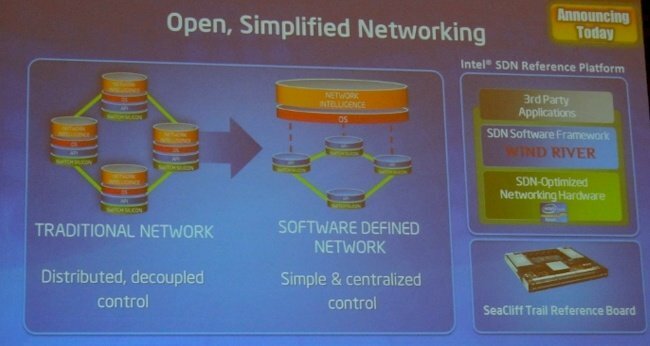 According to Bryant, the company is not just providing the hardware components to OEM customers in the switch racket, but also a full network operating system that supports software-defined networking (which means a lot of different things to a lot of different people) cooked up by real-time operating system subsidiary Wind River. This operating system is based on the Linux kernel and supports OpenFlow protocols, which separate the control plane of the switch from the forwarding plane and makes it externally programmable by an OpenFlow controller. The switch that Intel has cooked up is based on the FM6000 series of ASICs created by the team from Fulcrum Microsystems, which Intel ate last year to get into switch silicon. Specifically, the top-of-rack version of the Seacliff Trail reference switch platform will use the FM6764 variant of the next-generation of ASICs out of the Fulcrum team. The FM6764 ASIC supports OpenFlow 1.0 control protocols and VXLAN, the extended LAN virtualization protocol espoused by VMware that puts a Layer 2 overlay on top of Layer 3 networks so virtual network links don't break as virtual machines flit across data centers. The Fulcrum chip also supports the NVGRE alternative that Microsoft, Intel, Dell, and Hewlett-Packard have offered. The new "Trident II" ASIC from Broadcom, announced at the end of August, also supports both of these network virtualization protocols and has enough oomph to drive over a hundred 10 Gigabit Ethernet ports – or lower numbers of 40GE and 100GE ports, if that is what you want to do. Intel did not say how much switching bandwidth the FM6000 series of chips will have, but it has to be on par with this if Intel hopes to compete. Broadcom expects switch makers to announce their intent to use the Trident II chip before year's end, with products showing up in the second half of 2013. The Seacliff Trail reference platform also includes a 22 nanometer Core processor, which is part of the "Crystal Forest" AMC control plane module that does deep packet inspection, packet acceleration, encryption/decryption, and other kinds of coprocessing for the Fulcrum ASIC in the switch.